In no way does the the sleepy river town of Metropolis, Illinois with a population of 6,000 bear a resemblance to the huge sky-scraper laden fictional city in the northeast of the same name that was the hometown of Superman, but since it is the only real town in the US named Metropolis, it has laid claim to being the home of the caped wonder. The Illinois State Legislature even proclaimed it as such with a special resolution in 1972. A later comic book in the Superman series entitled "Massacre in Metropolis" paid homage to the Illinois town sending a villain in search of Superman there, confusing the two cities. He attacks a security guard and threatens various citizens until they reveal the true home of Superman. 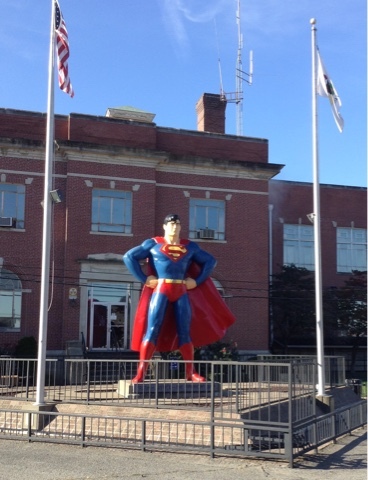 A fifteen-foot tall painted bronze statue of the Man of Steel with hands on hips stands gallantly in front of the county courthouse. 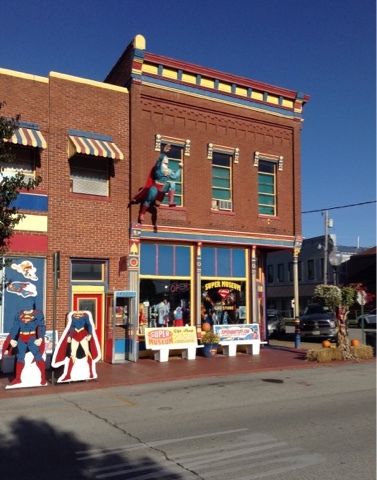 A block away is a souvenir shop and museum with Superman launching himself from the side of the building. It is crammed with mementos of Superman. It has aisles and aisles of costumes and trinkets, including Clark Kent glasses for $4.95 that claim to be UV compliant. Superman wrote for the Daily Planet. The Metropolis newspaper is the Metropolis Planet. The town holds an annual Superman celebration in June with panel discussions and a costume contest. I had to wait several minutes to take a photo of the statue while others posed in front of it. Illinois can claim a connection to a pair of the most renowned comic book characters. 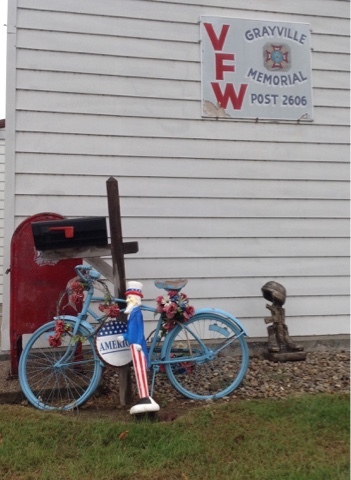 The town of Chester on the Mississippi, sixty miles south of St. Louis, is the home of the creator of Popeye. The town mirrors Metropolis with statues of Popeye and his cohorts and a souvenir shop. The Carnegie Library that had brought me to Metropolis was three blocks away within site of a casino that is the prime lifeblood of the town. I was joined outside the library waiting for it to open at ten by an older gent from Tennessee who regularly brings his wife to Metropolis so she can play the slots. While she gambles, he hangs out at the library and explores the environs. My bike had him wishing he had such a contrivance for getting around, even though he hadn't been on one in years. He wasn't sure what to make of me. He asked if my pedals were broken, never having seen the mere rod of a clip-in pedal. He asked to see the bottom of my shoes to see how they worked. 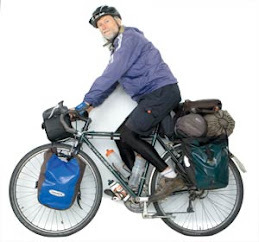 He could recognize that my panniers weren't simply bags lashed to the bike, but were likewise high-tech items. He worked in a factory and could appreciate good engineering. After a few minutes he said, "You talk like you have a college education. A lot of the men I work with have been to college." He said he liked to read "Mother Earth" magazine, making sure that I didn't think he meant "Mother Jones," of the left. He only reads it at the library because a subscription costs too much. He didn't object to his wife's gambling because it makes her happy, and allows them a relatively free vacation, as the casino gives them free lodging and food. She got hooked on the slots when she went to New Orleans with a friend and tried it for the first time. She had a $700 jackpot, and there was no turning back. He didn't realize the significance of this library, though he could appreciate its grandeur with its two added wings. He asked if there were any Carnegies in Tennessee. I knew there were a few, as I had been to some, but I couldn't remember how many. He recommended going to the old fort down by the river. It was about a mile away on my route out of town. It was initially established by Spaniards in the 1500s. The French took possession in 1702, then the English in 1764 until the Revolution. In 1908 it became the first state park in Illinois. A plaque gave credit to J. C. Blair, a 37-year old professor at the University of Illinois, calling him the "Father of the Illinois State Park System." It extended for nearly a mile along the river and then even further inland. It was heavily forested and most scenic and peaceful with rebuilt buildings and a visitor center. A couple miles out of town I turned north back to Chicago, that is if I'm not tempted to swing over to Indiana for some more Carnegies after I finish off Illinois about halfway up the state. 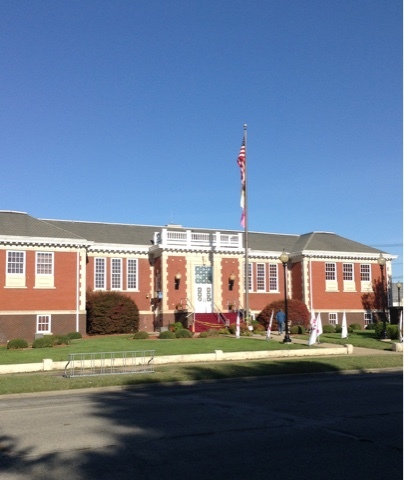 If my next Carnegie had been further along the Ohio River I could have stopped in at the National Quilt Museum in Paducah, five miles away across the river in Kentucky. It was nearly fifty miles with some climbing largely through the Shawnee National Forest to the Carnegie in Harrisburg. The sun was shining and the wind was at my back and all was well with my world. The continually unraveling pastoral scenery becomes more and more comforting the longer this now 3,000 mile ride goes. This is as good as any antidote to these acrimonious times. It is no wonder my every impulse is to keep riding. The Harrisburg Carnegie was the first in a while to no longer serve as a library. It resides on Church Street and has become a church--Episcopal--complete with a cross where Library had once been engraved. 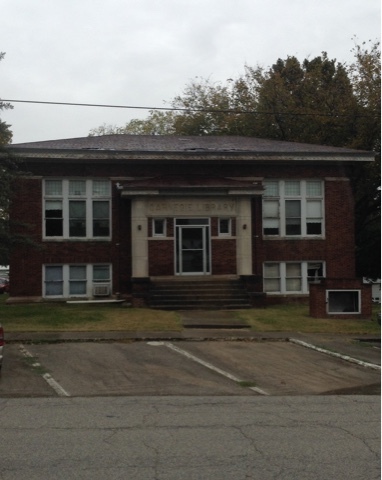 Across the street is the Harvest Deliverance Center Church, aptly named for an agricultural community. The four-lane highway out of Harrisburg was lined with fences guarding corn fields and small patches of forests and occasional farmsteads. After ten miles with dark descending I settled on a road construction site with piles of gravel and rock as my campsite shielding me from the road. I was half way to Carmi, 24-miles away, the next morning when the air became filled with a mist then a light drizzle. 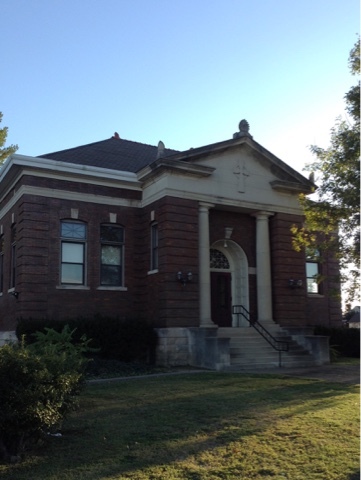 It didn't let up while I warmed up at the new Carmi library, a few blocks from its Carnegie, also on a Church Street. It's not a church though, but the genealogy branch of the library. A plaque tracing the library's roots concluded with "Not for self, but for all." The forecast was for rain all day and for the temperatures to fall. It was only 41 and I was still damp and chilled even after an hour at the library. I was resigned to spending a night in a motel. They aren't all that common these days in small town America. Carmi was big enough to have a motel. I feared it might be the last one for the day. 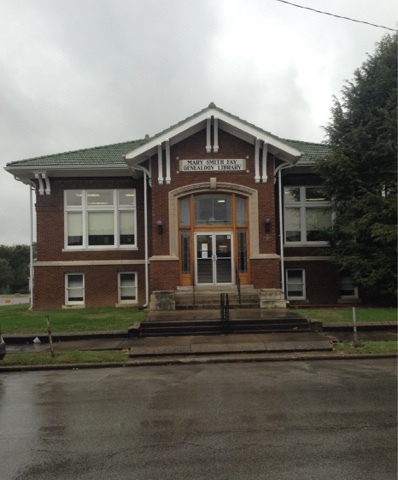 The next Carnegie was fifteen miles away in Grayville. The genealogy librarian told me it was smaller than Carmi but had two motels outside of town along the Interstate. "The Best Western has gone downhill," she said, "so I'd recommend the Super Eight." So I set out in the rain getting wetter and colder. Halfway to Grayville my feet and hands were soaked and near frigid. By the time I reached its Carnegie I could barely remove my gloves or get my fingers to function. I couldn't warm up in the Carnegie as it was now a vacant building. The librarian in the new library several blocks away said it was so structurally unsound that it wasn't even on the market. In a town of empty stores, there was no demand for it. It had been built over a cistern and had been collapsing. It had remained the library until 2011 even though when 18-wheelers would pass by on the highway a block away they would occasionally rattle books off the shelves. The librarian told me of a campground a couple blocks away along the Wabash River that had been a CCC campsite, but it had no place for me to warm up or to spread out my gear to dry. With frost warnings my shoes wouldn't dry in my tent, so I definitely had to retreat to one of the motels back a mile on Interstate 64. She confirmed the reputation of the Best Western as not being so clean. The library had a table full of free books and magazines. I asked if there might be any free newspapers, as wadded up newspaper soaks the moisture out of wet shoes. She had several in her recycling bin. Like Bunker Hill the town was decorated with painted bikes, twenty-seven of them I was told by the woman responsible for the project. 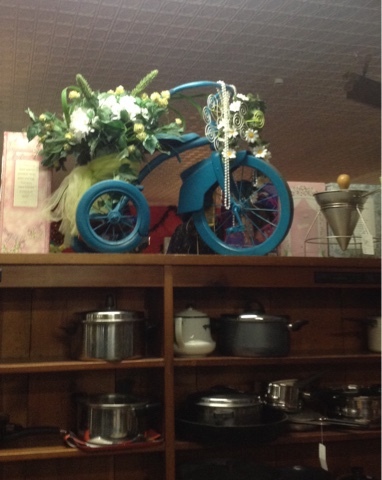 She owns an antique and knickknacks store embellished with a few decorated bikes which are not for sale. She got the idea from Mount Vernon in Indiana on the other side of the river. 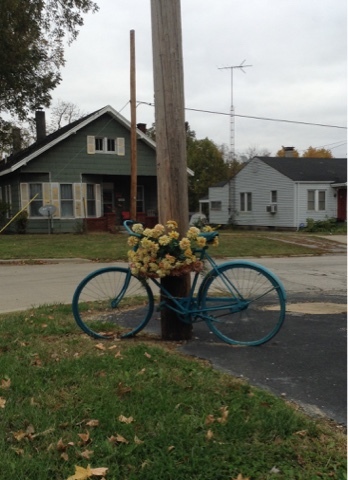 She wasn't a bicyclist, but appreciated the pallet they provided for her art. Though I haven't seen many people riding bikes on this trip, it has been pleasing to see bikes considered as objects of art, unless this is an indication that they are now being regarded as objects whose time is past, and that they are going the way of the dinosaur. What a great life you live, George. 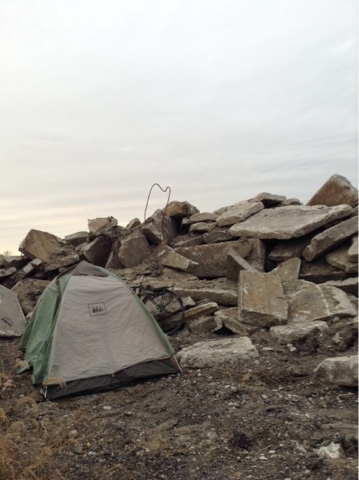 I like it when you post pictures of your campsites.